I came to yoga and coaching in my early twenties. Yoga came first. I was diagnosed with ulcerative colitis and was feeling very low about myself and my life. One of my consultants in my local hospital came to me and said if I wanted to get better I needed to make changes in my lifestyle and he suggested. I had always been interested in yoga and so when I was discharged I went to a local community centre in Dublin and signed up. I was hooked! The practice began to change everything for me and I became hungry to learn more. My illness eased and although I wasn’t cured overnight, life became more enjoyable again as I reduced my stress levels and was able to live without chronic pain every day. I made a choice to travel and take some time out and in 2005 I left Ireland for Asia & Australia. It was while I was living in Australia and working in PR when I came to Power Vinyasa Yoga. What I loved about the Baptiste method was the transformational coaching that was a part of the practice. During my years practicing I fell more and more in love with yoga and I knew I wanted to train as an instructor. In 2008 I moved back to the UK and began my yoga teacher training with Yogacampus in London, UK. Since that initial training I have completed intensives with Baron Baptiste and Shiva Rea. I have most recently certified as a Forrest Yoga Instructor with Forrest Yoga Creatrix, Ana Forrest and teach Forrest Yoga; Power Vinyasa Yoga & a Yin / Yang Yoga practice. 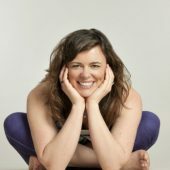 I teach at various Dublin & London studios – INIT Yoga Dublin; My Yoga Body Dublin; Indaba Yoga; Triyoga UK; Lumi Power Yoga; Blue Cow Yoga & Virgin Active and I have had the privilege of sharing yoga in Holland, Spain and Canada. My approach is one of dedication and intention with an element of lightheartedness.